Hi guys. It's finally Friday and I cannot wait to get home from work to get some rest. The week has been rough, but as I always say polish can make everything so much better. And that's exactly how I felt when I clawed my way into the press samples from Zoya. I have been looking forward to swatching these ever since the press release late last month and I know a lot of you have been dying to see them as well! Without further ado, here are swatches for the Paradise Sun Collection by Zoya for Summer 2015. 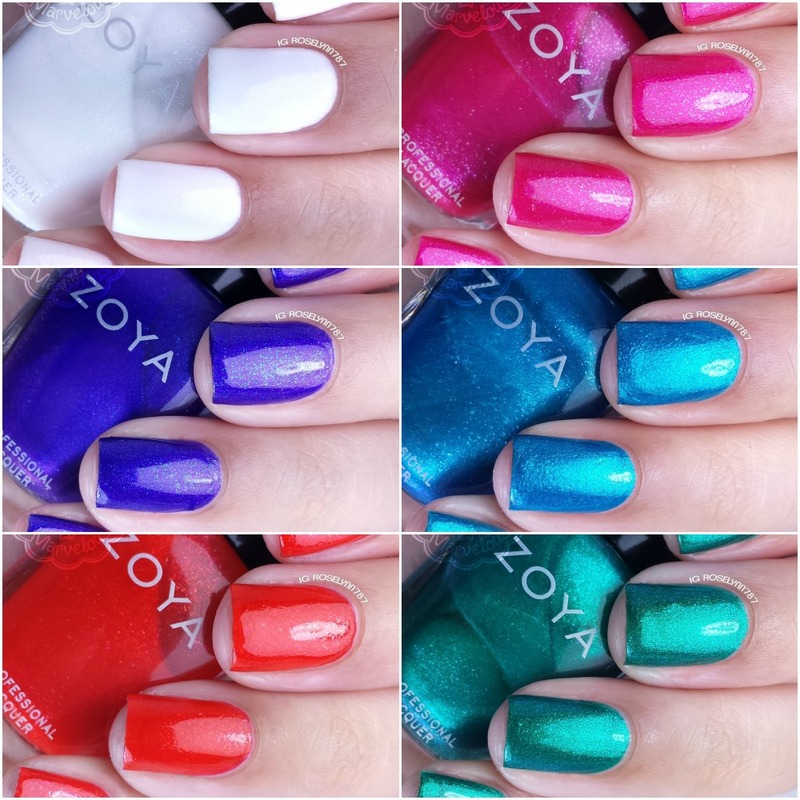 The summer release brings us two collections from Zoya: Island Fun (the cremes) and Paradise Sun (the metallics). I will be dividing my review between the two sets and in today's post I will be showing the six that make up Paradise Sun. All the shades featured in this half of the collection are fully saturated with a gorgeous micronized metallic sheen. These shimmering beauties are much like sunshine sparkling on water! Zoya Isa can be described as a deep blue-based purple with a micronized metallic pearl finish and an aqua flash that embodies the beauty of exotic island flowers. I usually save the best for last, but I couldn't help myself when it came to this blurple beauty. The formula was a little bit thin, but it didn't flood my cuticles during the application process. There was also no staining with this shade, which is always very nice to hear. The one concern with this polish was the smell, it did have a stronger off-putting scent in comparison to the rest. Swatched here in two coats and sealed with Seche Vite topcoat. Zoya Genesis can be described as a crystalline white with a micronized metallic pearl finish. Designed to look like micro-fine diamond dust! Very pearly with that touch of elegance due to the shimmers. I liked this one a little more than I was expecting to, but I cannot get over the fact that it reminds me of snow haha. Formula was streaky and caused uneven layering in the first few coats. The consistency with this one was a lot more balanced and not as thin or thick. Swatched here in three coats and sealed with Seche Vite topcoat. Zoya Mae can be described as a warm magenta pink with a micronized metallic pearl finish, reminiscent of vibrant Mediterranean flowers. Such a gorgeous shade and this is coming from someone who tends to shy away from pink in general. Out of the entire set, this one had the best consistency and the formula throughout. Very opaque in a single coat and the application is smooth as butter. Swatched here in two coats and sealed with Seche Vite topcoat. Zoya Oceane can be described as a true turquoise with a micronized metallic pearl finish that reflects the clearest blue ocean waters. I feel like I could get lost in this shade, it's so breathtakingly gorgeous. Sadly even though this should be one of my favorites, it does cause a little bit of staining on the nail-bed and cuticles. The formula was on the thin side and the brush strokes are a little bit noticeable. Swatched here in two coats and sealed with Seche Vite topcoat. 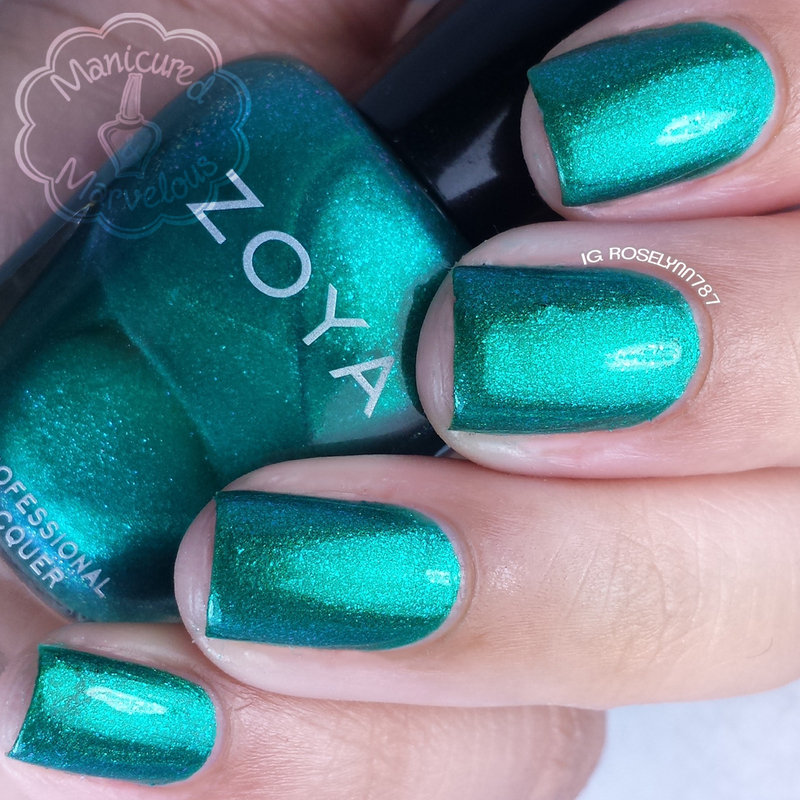 Zoya Selene can be described as a true teal with a micronized metallic pearl finish. A unique shade with an aqua fleck that resembles deeper layers of ocean water. Teals usually make my heart do little flips and jumps, but there was one thing I cannot get past with this shade. The staining. Unfortunately this is another stainer from this collection and you will need a good layer or two of base coat. Formula was a little on the thin side causing a bit of cuticle pooling (which is added horror with a stainer). As with all the others, this is very nice and opaque with just a single coat. Swatched here in two coats and sealed with Seche Vite topcoat. 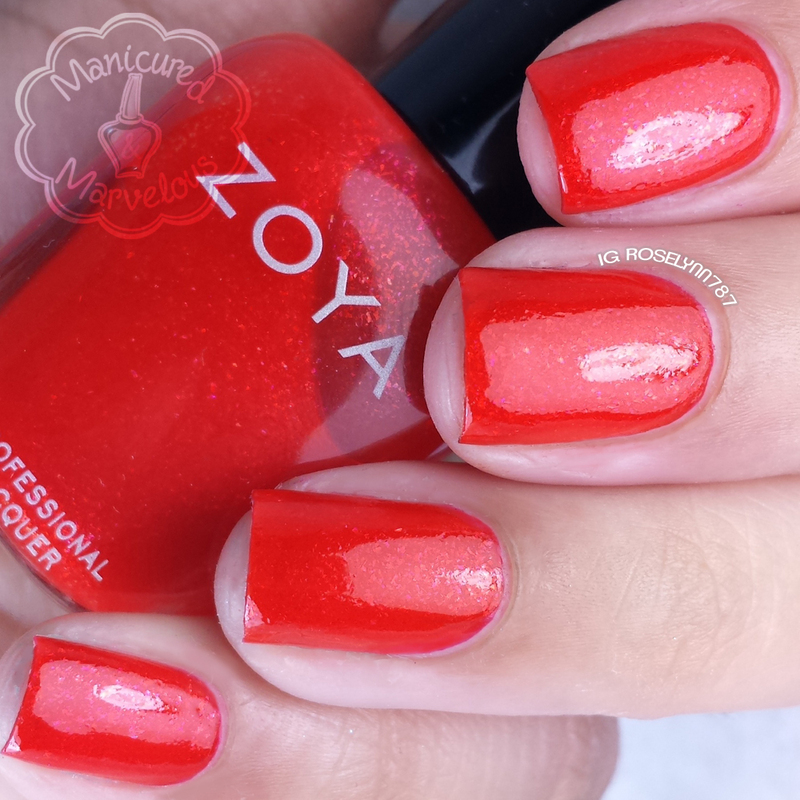 Zoya Aphrodite can be described as a vibrant summer red with a micronized pearl metallic finish and multi-hued flash that brings it to life. Doesn't it look like a fireball?! 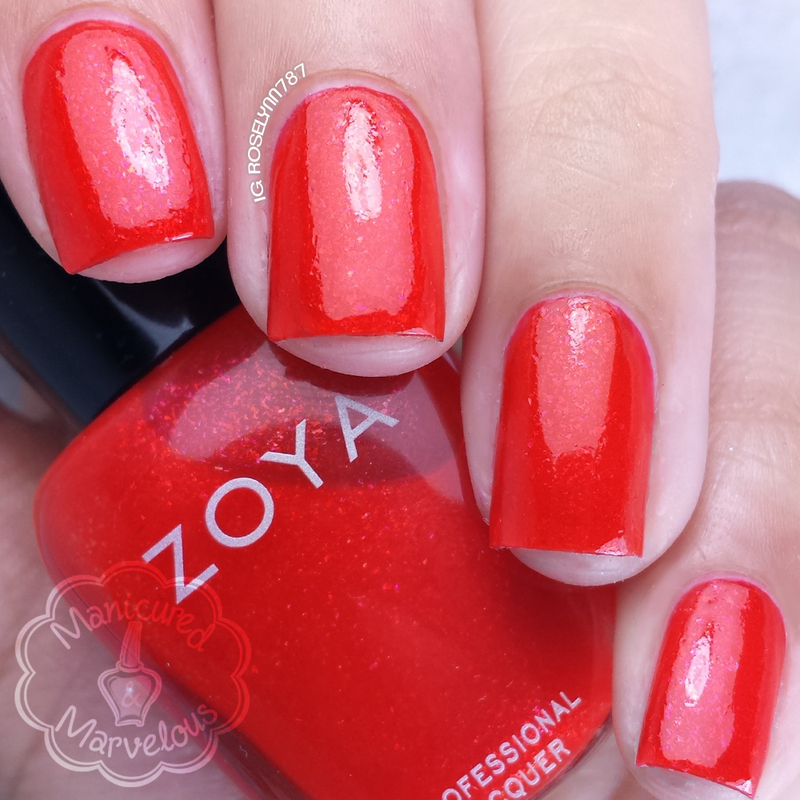 I am a major fan of reds and this one is gorgeous thanks to the shimmering spark in the finish. One of my favorites without a doubt. Formula and consistency were great and matched that of Mae. Each layer was opaque and not too thin or too thick, very well balanced. Swatched here in two coats and sealed with Seche Vite topcoat. Overall I'm not as blown away as I hoped I would be with this collection. That said there are some must-haves in this for me and those would be Aphrodite, Isa (if you can stand the smell) and Mae. The staining was disappointing and while it's nothing a whitening session won't fix, it's still a bit off putting to have to deal with. Now, of course, I am so looking forward to swatching the other half of this release which would be the creme polishes. I have high expectations for those and you guys will be able to catch that post sometime this weekend. All of these are super pretty! 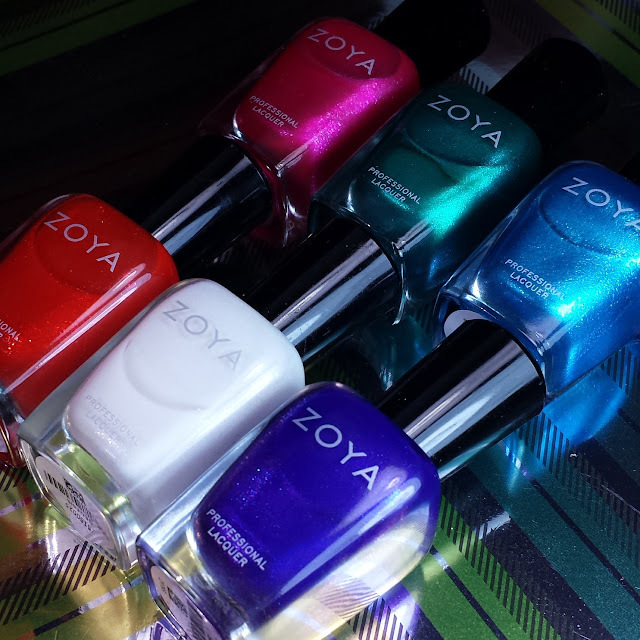 I love Zoya's summer collections! Thanks! I definitely agree, they always know how to make a statement with their releases. 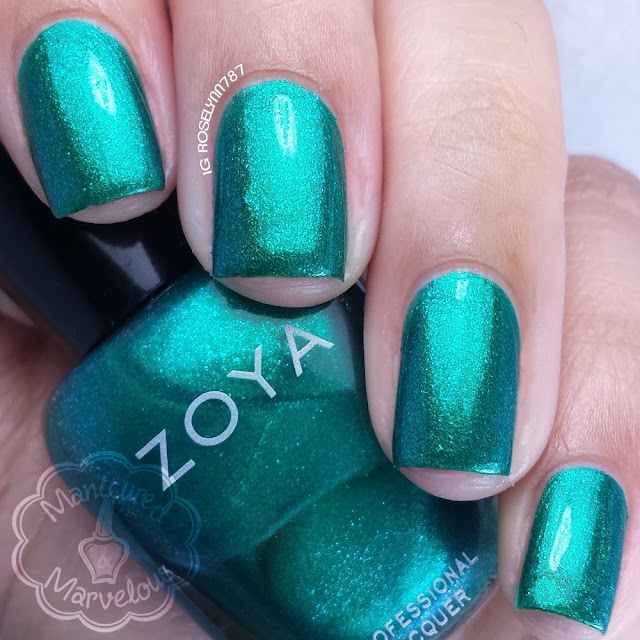 Gosh, I love zoya! I need these in my life. These are so pretty. I need to play with mine ASAP! Oh wow! I feel like I need this entire collection! Great swatches! Zoya really nailed it with this collection I think. Im curious how a few of these compare to other Zoyas. 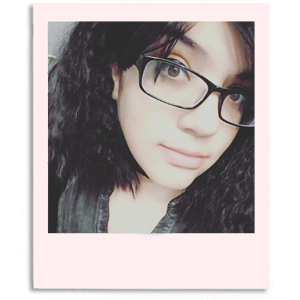 Selene looks like a flaky version of Giovana. Isa & Selene both look really pretty. Isa, Mae and Genesis and my picks :) I have a very low tolerance for staining...we don't get much here that helps whiten nails. Look at Isa! So beautiful! I feel the same way, when I have a rough week, polish can be a comfort. And I have been looking forward to see this collection too. They have not arrived yet but soon I will see them in person. Isa! Wow soooo pretty! I've been finding a lot of blues lately that smell weird, specifically like skunk lol Is that what this one smelled like? Your swatches are amazing! The macro pictures are stunning. I'm sad to hear about the staining, I'll be swatching mine this weekend so I'll get to see it for myself. Beautiful swatches!! I have found that I love Genesis for nail art, gives the background just a bit of sparkle. Ooooh ISA is stunning!!! Beautiful swatches! Both these sets are next on my list to swatch. I'm so disappointed in the staining, but glad I have the warning. Your swatches are divine, and I really like the appearance these polishes! Staining is a pain, but those flakie shimmers are too gorgeous!. I skipped picking up this full collection and just got a few of them - one being Isa, and I'm glad because it is such a stunner to me! Your swatches are so gorgeous! I'm excited to swatch these (and the cremes) but you all have me terrified of stains at this point! This is a beautiful collection! Your swatches are amazing! Beautiful swatches as always! I'm having a little swatch envy going on..haha! I think my fav is Selene! These are pretty polish but I feel like they aren't terribly unique. I'm glad I decided to skip this collection especially since you had issues with staining. You have some great macro shots here! I feel the white shade is the most unique, those little shimmering flecks just break the surface so nicely! Gorgeous swatches! I'm doing mine now, I'm loving these! !